Explore, observe, and compare samples of decomposing materials and use reasoning to determine the level of decomposition among them. Search for and classify decomposers (or evidence of them) as fungi, bacteria or invertebrates. 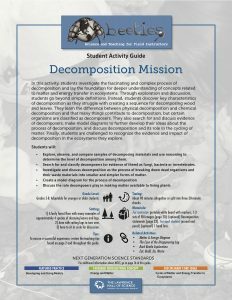 Investigate and discuss decomposition as the process of breaking down dead organisms and their waste materials into smaller and simpler forms of matter. Create a model diagram for the process of decomposition. Discuss the role decomposers play in making matter available to living plants.